PREREQUISITE: MUST KNOW SINGLE-NEEDLE RIGHT-ANGLE WEAVE WITH ONE BEAD ON EACH SIDE OF THE SQUARE. NanC Meinhardt has designed a challenge for you in her “Very Tailored Bracelet.” The end result is a bracelet that is easy to wear and will fit nicely into your wardrobe. NanC, the originator of “free-form right-angle weave,” leaves her intuitive nature behind for this tailored design. 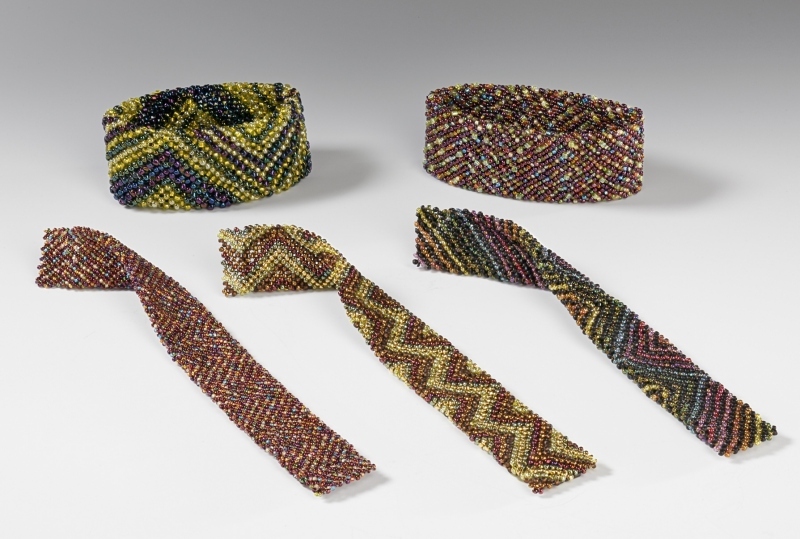 You will use tubular right-angle weave and a diagonal pattern that changes direction several times within the bracelet, to accomplish this deceivingly simple-looking piece. Bring your knowledge of right-angle weave to class, and explore a new technique to add to your repertoire. 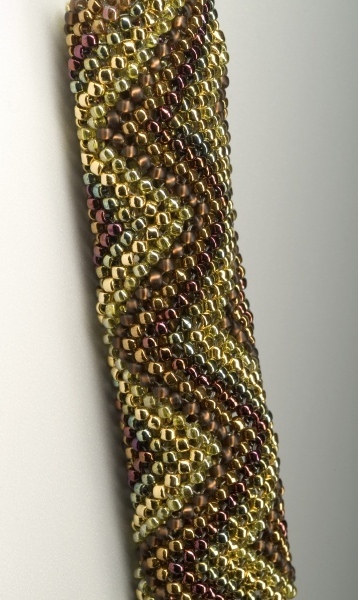 The Very Tailored Bracelet can be made in size 14/15, 11, or 8 seed beads. You can also use size 10 triangle seed beads. My supply list is not a must-have list. Rather it is a list of suggestions. I have made this bracelet with one color alternated with a “bead soup” making up the second color. I also made one using as many as seven different colors, all the colors being in the same-size seed bead. The following list are the colors I used in yet another “Very Tailored Bracelet." For this one I used size 14/15 seed beads, though you may also use the same color selections with size 11 seed beads. 20 grams of color A seed bead. This color is one of the diagonal stripes in the bracelet.